Are we in the Third Golden Age of Philippine Cinema? No one seems to be saying it, but I believe we’re in the Third Golden Age of Philippine Cinema. It’s also possible that we’re not, because I’m not a legitimate film critic and those who are aren’t saying anything to this effect. But I believe we are because so many Filipino filmmakers are releasing quality films that are winning or being screened in international film festivals. This year alone, Lav Diaz won both the Silver Bear Alfred Bauer Prize at the 66th Berlin International Film Festival for his opus Hele sa Hiwagang Hapis (A Lullaby for the Sorrowful Mystery) and the Golden Lion for Ang Babaeng Humayo at the Venice International Film Festival. Berlinale and Venice are two of the most important festivals in the world, so winning both in the same year says a lot. At the same time, other Filipino films are being screened internationally, like Jun Lana’s Die Beautiful at the Tokyo International Film Festival, Louie Ignacio’s Area at the Eurasia International Film Festival (which won the Special Jury Prize), Adolf Alix Jr.’s Mrs. at the Vancouver International Film Festival, and Mihk Vergara’s Patintero: Ang Alamat ni Meng Patalo at the Silk Road International Film Festival in China. I had the privilege of seeing Patintero when my good friend Shinji invited me to the premiere a few days ago. 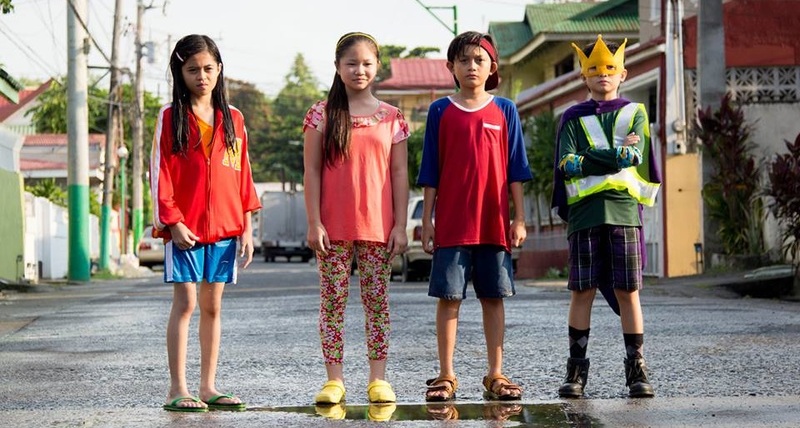 The film follows Meng Francisco, a 10 year old who loves one thing: the old-school game patintero. She’s terrible at it and is teased as patalo, or loser. It was a fun and nostalgic watch, and not something you see in mainstream cinema these days. It was first screened at last year’s QCinema Film Festival, which explains its indie feel. I wrote a “review” on WhenInManila.com. If it isn’t the Third Golden Age of Cinema, I believe that Patintero and other films coming around this time are ushering in a new age, like what Lamberto Avellana, Gerardo de Leon, and Eddie Romero did in the ’50s and what Ishmael Bernal, Lino Brocka, and Mike de Leon did in the ’70s and ’80s. Smarter and more compelling films are showing in theaters. How do we sustain this? It is for the directors, screenwriters, and actors to continue breathing life to Filipino stories. It is for the government and the private sector to support them through grants and screenings. And for everyone else, it is for us to continue watching. 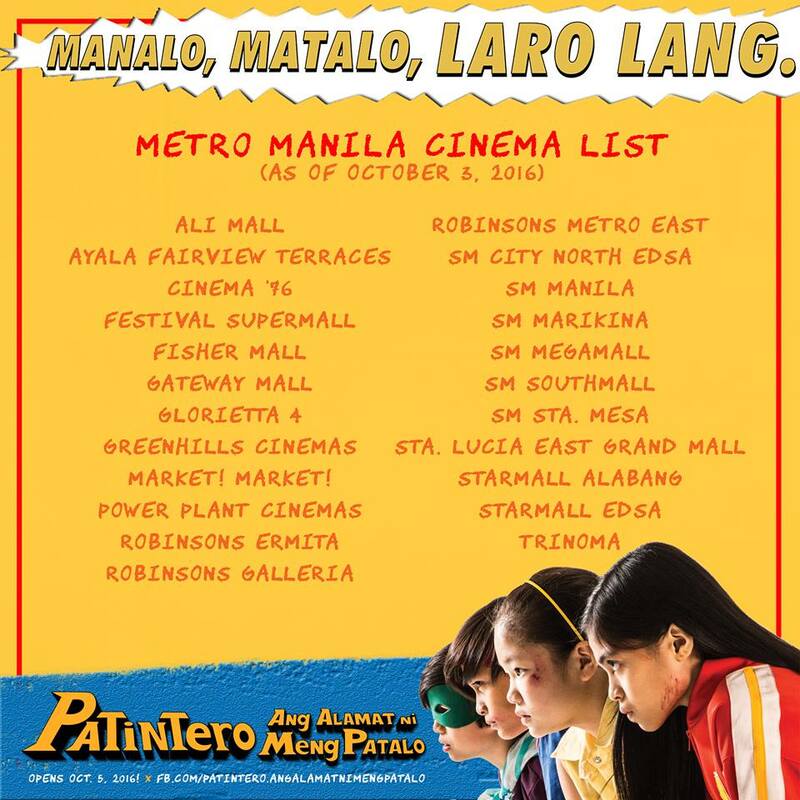 Patintero: Ang Alamat ni Meng Patalo will be screened starting October 5, 2016. It is produced by TBA (Tuko Films, Buchi Boy Entertainment, Artikulo Uno Productions), the same team behind last year’s critical and box-office hit Heneral Luna. Students who watch at SM Malls and in Fisher Mall can avail of a 50% discount if they present a valid school ID.